Never Bored Creations: Do you wanna build a snowflake? Do you wanna build a snowflake? A quick catch up. Louisville, Kentucky, was a real experience! Now to get ready for Powell Gardens in Kansas City, Missouri, April 28-29! Folks watch me demonstrate and say, "That looks easy." They always ask, "How long does it take for you to make __________?" 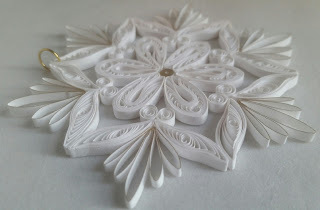 I don't want to discourage them from trying the art on their own; however, I've been quilling for over 7 years and this is my fourth year of quilling full-time as my business. It better not take me 20 hours to do one snowflake. It better not take me more that 40 minutes or the profit disappears! So my response, "I have somethings that take 10 minutes and others that take 30 hours....plus 7 years experience." This last comment gets them to chuckle and we can step away from the "easy" or "how long" comments! So to those who have had Patsy's snowflake experience....I'm sorry! To those who made it through the first 20 hours of a snowflake and marched forward....Thank you. Here's to our great-grandchildren admiring our enshrined snowflake!